On the weekend of February 2-3-4, 2018, boat lovers from across the country will make their way to Biloxi, Mississippi's Mississippi Coast Coliseum & Convention Center for the 61st annual Biloxi Boat Show, an event that's grown into one of the Gulf Coast's biggest and most popular over its more than half-century-plus history. More than two dozen different boat manufacturers are expected to be represented at the 2018 show, with a wide variety of marine craft on display, ranging from the latest models in paddle boards, canoes, jet skis and powerboats to luxurious cabin cruisers and yachts. In addition, the event features vendors for every marine-related accessory imaginable, from boat motors, electronics (depth and fish finders, navigational aids, radio and sonar equipment, etc), fishing gear (rods and reels, tackle boxes & accessories), clothing, docks, boat lifts and trailers, safety equipment, and everything in between. Window-shopping has always been a popular attraction of the three-day event, but it has also earned a well-deserved reputation for being one of the southeast's ideal venues for shopping and comparing the very latest in not only boats, but with event organizers offering multiple on-site financing options, making the Biloxi Boat Show a 'one-stop' marketplace. Another event feature that's become a favorite for boating and fishing enthusiasts of all ages are the daily seminars conducted by veteran local and regional guides who demonstrate their tricks-of-the-trade as well as providing invaluable, expert advice and helpful suggestions to attendees. In addition to information-sharing workshops for 'serious' boaters and fishermen/women, there are also exhibits for younger and beginning fishermen, with plenty of free giveaways, contests and drawings for prizes. Attendees who seek entertainment won't want to miss Shark Encounter, a thrill-a-minute exhibition featuring live sharks, highly-trained (and brave) divers interacting with sharks, as well as educational and entertaining displays and seminars related to this fascinating (and often misunderstood) ocean dweller. Along with the sharks, visitors of all ages will enjoy the Fetch-n-Fish interactive dog show, a longtime returning favorite at the event which features trained dogs who perform incredible diving and 'fetching' feats in and underwater. There are also interactive exhibits that provide attendees the opportunity to try their canoeing, kayaking and paddle boarding skills in the event's huge demonstration pool. 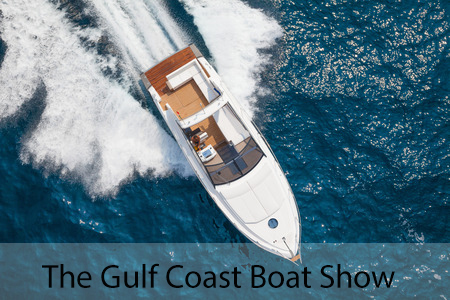 The Biloxi Boat Show also features live entertainment and food kiosks conveniently located throughout the venue.